275 or so people congregated on the small town of Sebastopol, located 60 miles north of San Francisco in the heart of wine country, for the 2008 Foo Camp this last weekend. Attendees included technologists, professors, researchers engineers, major company executives, billionaire entrepreneurs, students, press and the odd astronaut. They all had one thing in common – a love of technology. Foo Camp, which stand for Friends of O’Reilly, is an annual three day tech event put on by O’Reilly Media at their Sebasopol headquarters. They supply a huge lawn area where attendees put up tents, food and drinks, bathrooms, Wifi and one very large blank piece of paper marked off in a grid. There is no structure to the event – if an attendee wants to hold a session on anything at all, they simply write the name of the session somewhere on the grid, which tells people what day/time and place the session will be held. People attend any sessions they like, and with 15 or so happening at any given time, there may be 2 people, or 75 people, in any particular session. In one session on Sunday that I co-led with Tim O’Reilly and Danny Sullivan, we debated the need for competitive search. This was an offshoot of a previous debate we held on our blogs, but this time with audience participation in real time (including people from the companies being discussed). The sessions are in an unconference format, meaning the leaders are there to guide the discussion only. Audience participation isn’t just encouraged, it’s a well exercised right (in the picture to the right, you can see Wikipedia founder Jimmy Wales behind the table with his hand raised to make a comment in the “user generated meta data” session led by Esther Dyson). With so many different types of interesting people in any given session at any time, the conversations tend to be fascinating, and occasionally explosive. Everything said in sessions is off record, although people tend to Twitter most of the conversations anyway. Hallway/lawn conversations are also off record unless everyone agrees otherwise, which is rare. For the most part, people speak freely about their ideas. For bloggers and press, it’s like being in a candy store but not having any money. You can listen and talk, but you can’t write about the endless streams of tidbits you pick up. Between sessions and late into the evening people talk, try out gadgets (I had my first ride on a Segway yesterday, and watched some 3D video on a huge LCD) and generally geek out. In the evening beer and wine is served, and the hard alcohol comes out later. People stay up talking and playing a social game called Werewolf into the wee hours. I got sucked into the hugely addictive game last year, and wisely stayed away this time to get a little sleep between sessions. 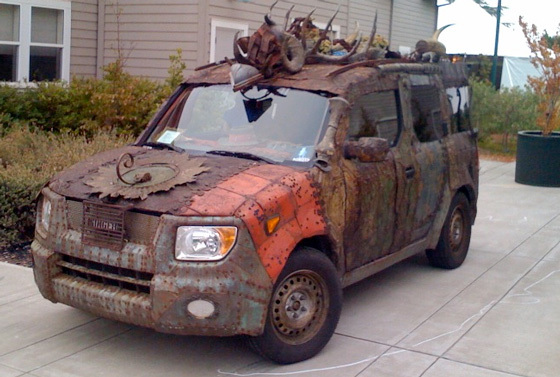 Past attendees eagerly await their invitation to Foo Camp in the Spring, but most are disappointed. 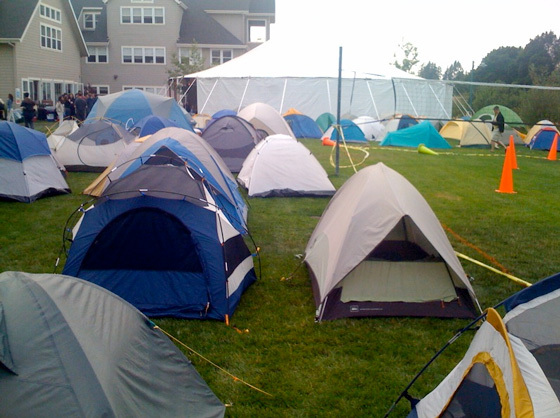 O’Reilly tries to make sure that half of all attendees in any year have never been to a previous Foo Camp. That means most people don’t get in again after attending, and it’s rare to meet an attendee who’s been to more than 2 or 3. 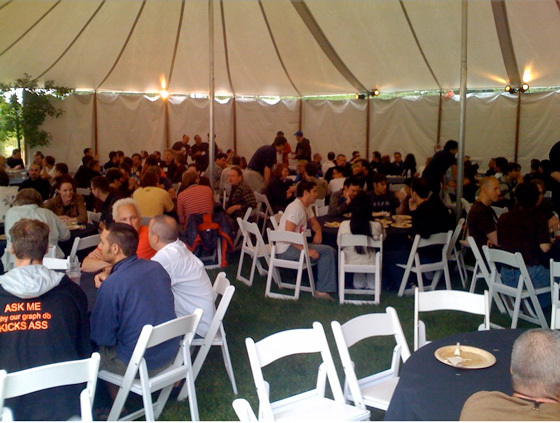 Foo Camp isn’t perfect – it is invitation only and the exclusivity of it has caused extensive griping over the years. 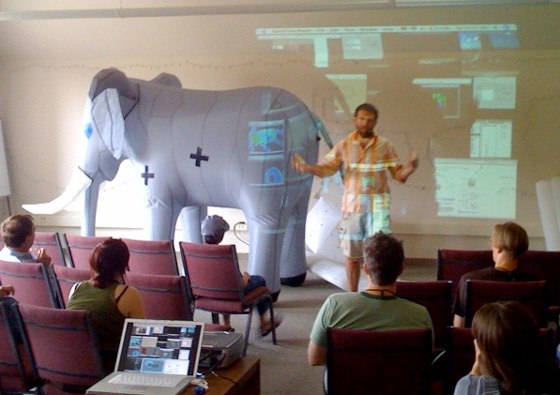 An open version of Foo called Bar Camp sprang up in 2005, and those events are held all over the world for anyone who wants to attend. But the imperfections aside, Foo Camp is a special event that leaves most attendees charged with ideas for new things to change the word, and new friends to stay in touch with. It reminds me of everything I love about Silicon Valley, without all the annoying distractions that come and go with the ups and downs in the flow of venture capital.